Antiphonaries and a triptych, circa 1390. * Life of St. Martin (also Fiamminghino); choir stalls paintwork. * Life of St. Alessio. * Transition of the Virgin. * Assumption of the Virgin. * Incoronation of the Virgin. * Life of St. Martin. 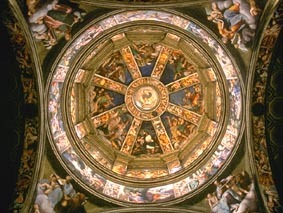 Il Guercino painted the dome of the Duomo (already begun by Morazzone in 1625/26) depicting the "Prophets". * The church was built by the great Renaissance architect Tramello. * Frescoes in the drum section of the dome, depicting the life of the Virgin. NOTE: The Palazzo Comunale (also called Palazzo Gotico; m.n.) is the most notable building in Piacenza; it is one of the earliest of such palaces of municipal life in Italy; it is in itself a most notable and harmonious building, boldly irregular, and gloriously successful in its irregularity, in the colouring and charm of the brickwork and marble, and in the richness of the elaborate terra-cotta decorations. It is the typical Borletto. There is an open ground storey; five lofty pointed arches on square piers of white marble carry an upper storey of red bricks, which is crowned by a marble cornice and the familiar forked or swallow-tailed "Saracenic" battlements. A deligtfully harmonious transition of colour is secured by lines of red and blu-grey marble above the white, and below the string-course, which separetes them from the red brik of the upper storey. Six windows of three lights, embossed under a round arch with a deep archivolt very slightly recessed, are set flat in the wall. They vary in size and detail, and are very elaborately decorated with terra-cotta work. They illuminate the Great Hall, where sat the Council of the State.